CBeebies All Stars, to be released on Monday 7th September 2015 by Abbey Home Media. 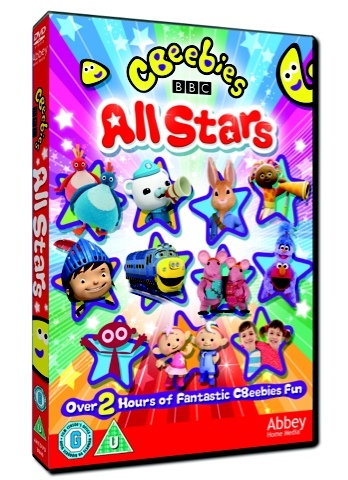 The DVD collection of CBeebies ‘All Stars’ is a great way of entertaining and educating young children. I've been watching this DVD with my two small people and they really love it - It features some of their favourite programs - Blake loves the Octonauts ad Furchester Hotel whilst Maegan is into Twirlywoos and Dipdap, because its a compilation it means that we have watched some shows that we don't normally watch or hadn't seen for a while such as Chuggington. Overall my children have really enjoyed this thoughtful and wonderful collection of CBeebies favourites. Twirlywoos – Twirlywoos come from far away, seeking adventure wherever they go. Join Great BigHoo, Toodloo, Chickedy and Chick for adventures on The Big Red Boat in Pop, the Twirlywoos have fun with bubbles when Peekaboo interrupts teatime. The Furchester Hotel – The Furchester Hotel is an ‘almost’ world-class hotel run by a close-knit family of cheerfully chaotic monsters. The series introduces brand new characters and also welcomes the beloved Elmo and Cookie Monster from Sesame Street. In Toast With A Smile, it’s Elmo’s turn to work room service. Will he make it to Harvey P. Dull’s door without falling, tripping, slipping, crashing or dropping the toast? Clangers – Get to know the whole Clanger family and all their friends: the Soup Dragon, the Froglets, the Iron Chicken and the Sky Moo. In The Lost Notes, the Music Tree notes for Tiny Clanger’s marvellous new melody are blown away when a big wind blows across the planet. No one can find them, and a search begins. Octonauts – Join Captain Barnacles and crew on their animated underwater adventures. In Fiddler Crabs, the Octonauts help clean up a beach after a storm, but things get tricky when the resident fiddler crabs hijack the Gup-D! Peter Rabbit – Beatrix Potter’s wonderful stories have charmed and entertained children for generations. Now fans can enjoy the brand new adventures of her timeless children’s classic Peter Rabbit from the new animated series. In The Lost Ladybird, our favourite rabbit loses Lily’s ladybird Florence, and the rabbits embark on a dangerous chase to recover her precious pet. In the Night Garden – Share in the magical Night Garden world with Igglepiggle, Upsy Daisy, Makka Pakka and friends in Tombliboo Eee Gets Lost, Tombliboo Eee is separated from his friends and needs to use Upsy Daisy’s microphone to help find them. Mike the Knight – Mike is an energetic, cheeky yet bountiful young knight-in-training, driven by his passion to help others and, along the way, be the best knight he can be. In The Special Signal, when Mike won’t teach his dragons a signal they’re able to do, they make up their own. But instead of calling Mike, it calls the Vikings! To rescue Sparkie, Mike has to learn the new signal – and to be a better teacher! Chuggington Take to the rails in the action packed adventure Iron Chuggers where the Chuggineers compete with the Steam Team for the coveted Iron Chuggers title. Dipdap –Butterfly and Balloons are two episodes taken from the series where a drawn line creates endless challenges and surprises for the unsuspecting little character, Dipdap. Dipdap is both entranced and confused by the antics of The Line. Cloudbabies – Who looks after the sky? The Cloudbabies do but in Grumpy Rainbow, Rainbow is in a bad mood, and his patience is tested further when he has to babysit Fuffa, Bobo White and Little Star. Topsy and Tim – Inspired by the books by Jean and Gareth Adamson, Topsy and Tim, is a live action drama inspired by the small stuff in little people’s lives, in New Babysitter when Mummy and Daddy go out for dinner, will the twins behave? Disclaimer: I received a copy of CBeebies All Stars DVD for the purpose of this review.